The story centers on a frog prince cursed by a witch and his servant, a caterpillar named Henry. 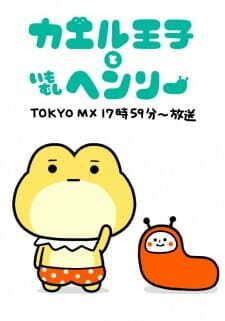 This anime tells a story about a prince, that was turned into a frog and his caterpillar friend Henry. Yet, it's totally episodic. You've got one joke per episode. Some of them are cute, others are just trivial. Art looks simple, but it's consistent and fit this series. All I can say about this, is that it does the job. I can't say a bad word about voice actors. They sounds great, especially if we consider that this is a low budget series uploaded for free on YouTube. Music suited the atmosphere of this show. Ending is alright, nothing special, but it's definitely too long. Episode is 40 seconds long and the ending alone is 20 seconds. It's a waste of time. Characters are simple and cute. I really like how churlish and easy going main character is, but I'm sure that I'll forget about him as soon as I finish this series. There is one reason why I enjoy this series. It's because it uses a really simple language. This is a great show for anyone that is learning Japanese and want to finally watch something without subtitles. Overall it's a nice change of pace compared to other shows and a great way to boost your language skills.